Customize your camera in-game via MCM. Also allows you to quicly swap sides or to set a view mode camera for landscape or portrait character. Fixed controller dead zone being too low when Improved Controls is enabled. - Re-implemented View Mode, now it comes with Horizontal slider. - Added additional $tags in the translation files for View Mode options. - Changed default hotkeys to unnassigned. Now it's an opt-in thing, not opt-out. - Changed profile filenames in order to help users with non-english systems. I'm not sure if this fixes the profile not found issue, but I hope it helps. - Minor fix behind the hood related to the MessageBox that appears when loading a profile. You can find the translation files in "Data\Interface\Translations\"
The respective files start with "customizable camera_" in their name. - Fixed TFC hotkey not being properly unregistered if it's unnassigned when loading a profile. - Minor fixes to MCM interface and Profile loading. - Implemented Proper Aiming as a toggle-able feature. This is good if you want to uninstall Proper Aiming to save a plugin slot. This is persistent between saves, it's recommended to restart game after disabling this. - Added Profiles system. This requires PapyrusUtil else it won't work. - Moved Field Of View from right side to left side in MCM. - Swap Side key allows you to change the camera sides quickly at the press of a button. - TFC Mode lets you toggle between normal camera and a flying camera that you can use to explore your surroundings. - Adaptive Sneaking allows you use a separate height slider for sneaking, useful if your character is in your way and can't aim. - Adaptive Crosshair hides the crosshair when using melee weapons and shows up if you're using ranged weapons or spells. - View Mode, a feature toggled by hotkey that switches to an user defined camera for various purposes such as portrait view or eagle view. - Profiles system to save and load from external files. Needs PapyrusUtil to be installed for this feature to work. Localization support is available beginning with version 2.03. Translation files can be found in "Data\Interface\Translations\..." starting with "customizable camera_XXX" in their name. There are still some messages stuck in english, that's because I've been unable to make those change-able in translation files, but they are rare so I hope it doesn't bother anyone. - Any mod that alters the camera through scripted INI editing is directly incompatible. 1.Install via your favorite mod manager. 2. In game, wait for MCM to message: MCM registered 1 new menu(s). Only after that it will appear in MCM. If it doesn't appear, save and load and wait a little again. 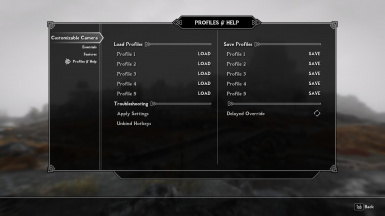 To uninstall simply remove Customizable Camera from your favorite mod manager. Remember to draw your weapon out and then sheath for the game to restore the vanilla camera after uninstalling. These are old remnants of the older versions that used to have loose files instead of BSA.